Diamonds may be a girl’s best friend, but I have yet to meet a woman who would turn her nose up at the prospect of receiving a ruby, or maybe an emerald. Sapphires are about 50/50, I’d say. And no one wants onyx. But in our game this week, all of these precious gems are equally important, so you can pretty much ignore everything I’ve said up to this point. 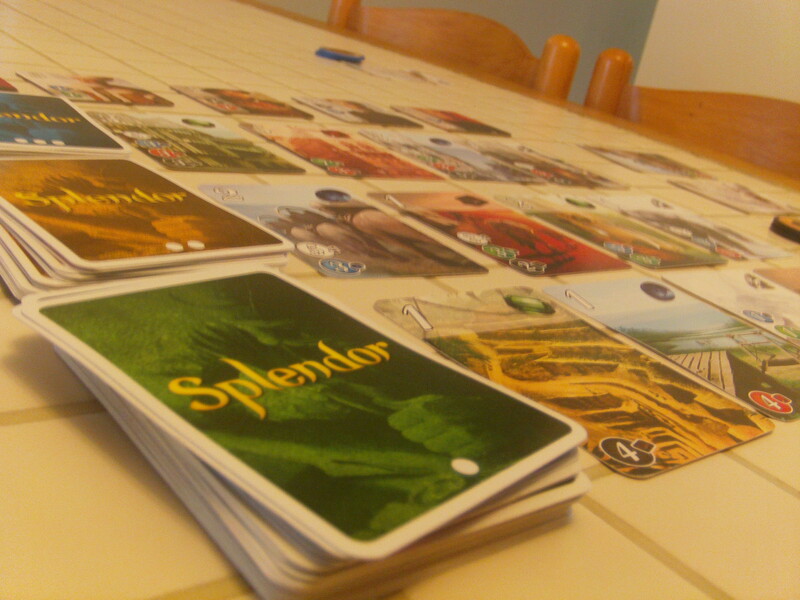 So, Splendor is a card game by designer Marc André and published by Space Cowboys. This is a game for 2-4 players with games lasting on average 30 minutes. 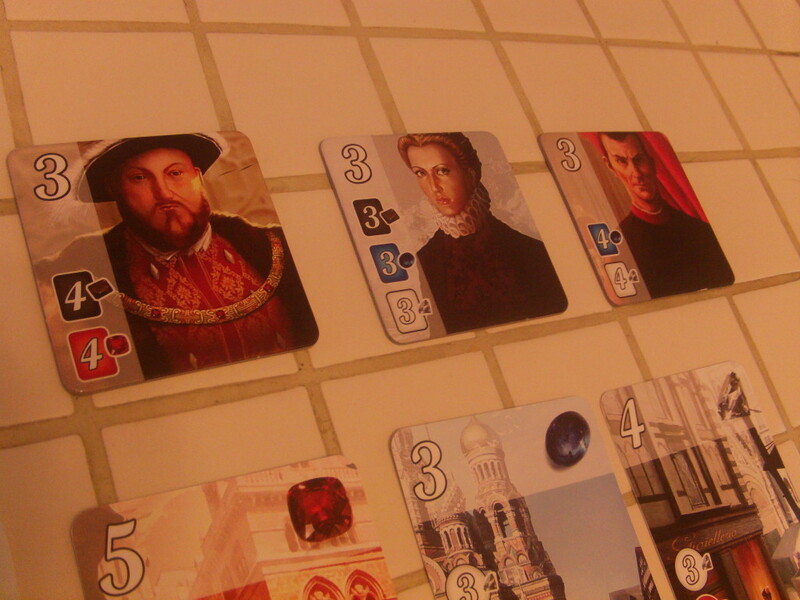 So, in this game, each plyer takes on the role of a jewel merchant during the Renaissance in Europe. You will trade in precious stones to build your infrastructure to the point that you attain the patronage of wealthy nobles. The first person to reach (or surpass) fifteen points signals the end of the game, which allows each other player one more turn to achieve more points. Each player can take one of four actions on their turn. They may either 1) take three Gem Chips (each of a different colour), or 2) take two chips of the same colour (but only if there are four or more chips of that colour available), or 3) reserve a card that’s available for purchase by putting it in your hand (this also earns you a gold chip- wild chips that can be used as any other chip), or 4) purchase a card by paying the cost of gems and laying the card face up in front of you. That’s it. You do one of those four things and then it’s the next player’s turn. What mixes this game up are a couple of things. First, the cards. Cards are separated into three rows. As you move up from one row to the next, the cards are more expensive, but they also give you more points. Furthermore, you can use any cards you have purchased as a permanent resource that you can use repeatedly to pay the cost of better cards (instead of Gem Chips). So the more cards you purchase, the more resources you have at your disposal. What soon develops is a little machine of your own design, chugging away and getting you closer and closer to that fifteen point goal. But be careful. If two players tie for first place, the winner will be the player with the least amount of cards in front of them. So while a massive empire of mines, gem cutters and jewelry stores may make the purchasing of cards easier, it could lead to your own downfall. The second aspect that keeps things interesting are the Noble Tiles. At the start of the game, a certain number of Noble Tiles are dealt face up near the cards. 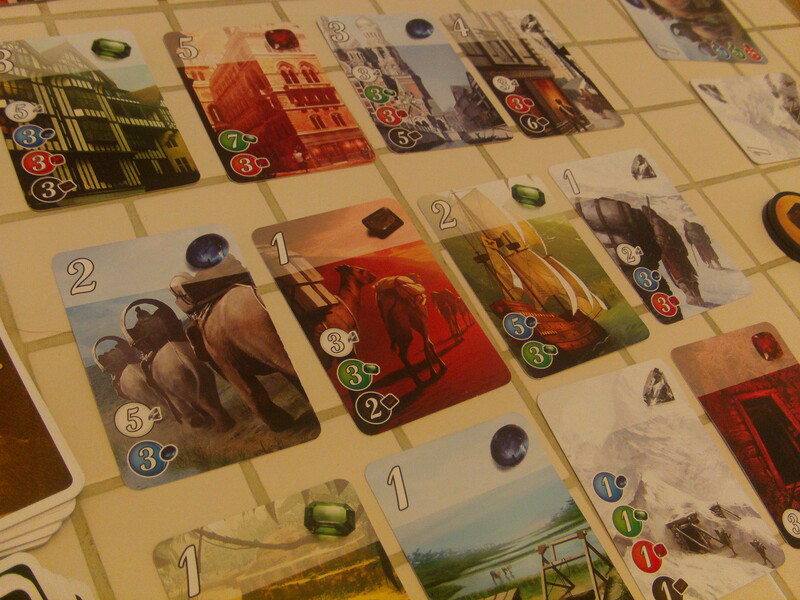 If at the end of their turn, a player has the amount of cards printed on the Noble Tile, they have won that noble’s patronage and get to add their points to their score. But unlike the cards, these nobles don’t replenish, so the first player to gain a noble’s favor will get a distinct advantage. This mechanic also gives you something to work towards in the cards that you purchase during the course of the game, giving you some direction. This also (say it with me, folks) adds replayability. Do you have what it takes to claw your way to the top? In addition, to this replayability, another thing I like about this game is its components. 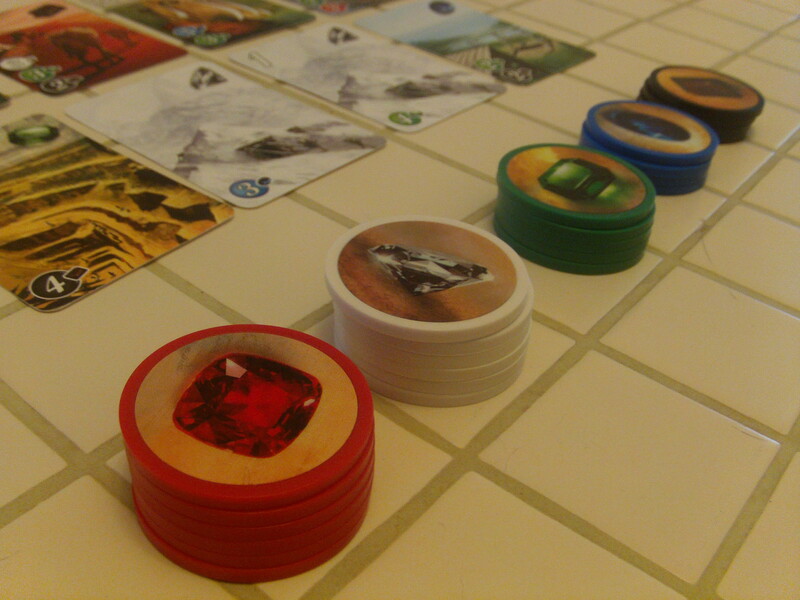 The Noble Tiles are a nice thick cardboard and the chips are a surprisingly heavy plastic. They feel great in your hands and you can’t help but play with them as you’re waiting for your turn- click click click. On the down side, there is not much player interaction in this game (besides reserving or buying a card that someone had their eye on as ruining their plans). You’re essentially doing your own little thing- but I like it. There’s a certain relaxed nature to this game. You can play it over drinks and conversation, much like Castles of Mad King Ludwig. 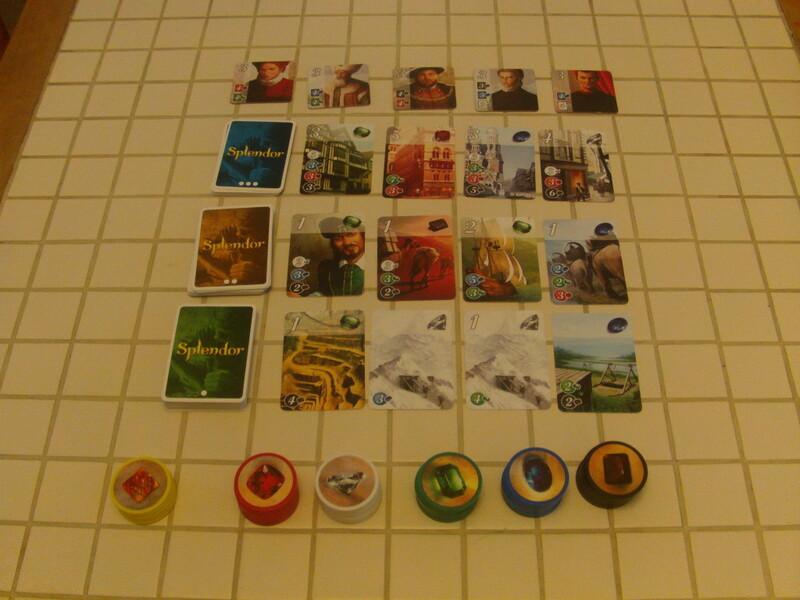 And as it turns out, Splendor was a big favorite this past year in the world or board games (even winning several awards) and I can see why. This game is tightly constructed, with little to no fluff- nothing feels superfluous. What’s more, I’ve played this game many times now with different people of varying ages (this one is a great hit with kids, by the way) and I find that the game never gets stale. 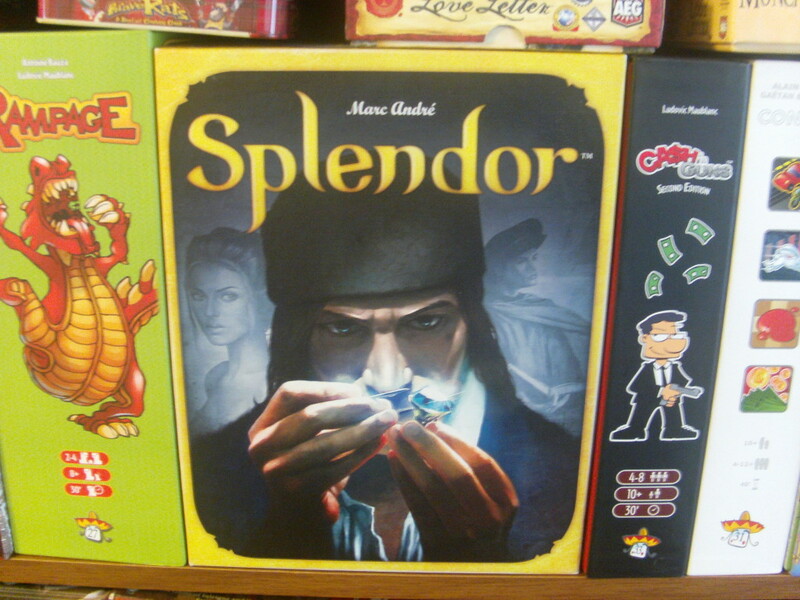 So for all these reasons, A Space Ahead heartily recommends that you add Splendor to your game collection if you haven’t already.